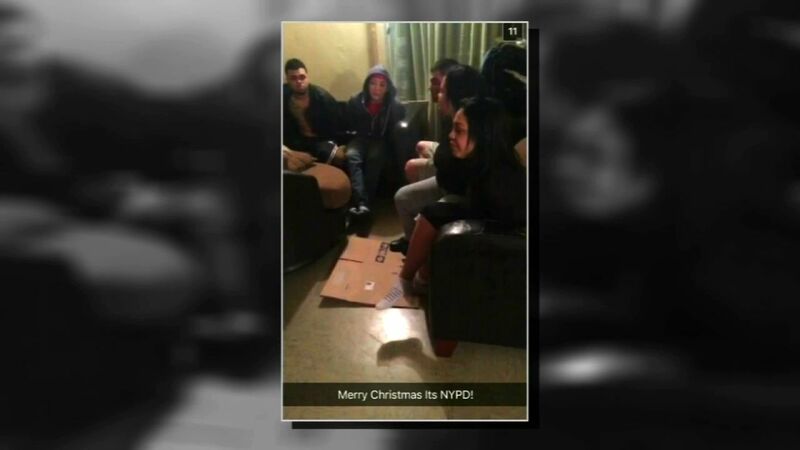 BROOKLYN, NY -- A family in Brooklyn is outraged after NYPD officers raided their home, put everyone in handcuffs and then posted a picture of them on social media with the caption "Merry Christmas Its NYPD." The ordeal led to the suspension of an officer. The Brownsville residents were so upset that not only did they file a report, but they also called 911. "The worst part was the Snapchats," Kimberly Santiago said. "That's what really got to me." The photo appeared in the "New York story" feed on Snapchat, which a public collection of photos and videos posted by users in NYC. The photo is under investigation by Internal Affairs, which late Friday said the officer who took the photo has been suspended without pay. The department also said the officers were at the correct address, and had a warrant to go inside the apartment. But they would not disclose why home was being investigated. "The things that he wrote, it's like, this what you all do?" Santiago said. "If he did that to, picture how many other families he's done that to. And he was the only one standing there watching us." She said the warrant squad showed up at her apartment around 6:30 a.m. Thursday, and they placed everyone inside the unit in handcuffs during the search. "Ya'll know that when you came to this house, looking for the wrong person that we don't even know," she said. She said the officers left after about three hours, and not only did they have the wrong address, but a second picture appeared on Snapchat with the caption "Warrant sweeps Its still a party smh." "We thought he was texting on his phone," she said. "Because the whole three hours we were sitting here, he was the one standing there. We saw him on his phone, but we didn't think an officer would do that." The NYPD has declined to name the officer or the squad to which he is assigned.